As every audiophile knows, David Hafler is a hi-fi legend. Among other advances, he’s known for his work, along with Herbert Keroes, on Blumlein’s ultra-linear circuit. In 1954 he founded Dynaco and soon became a household name. The Dynaco ST-70, one of the best-selling amplifiers of all time (it sold more than 350,000 units in its lifespan)—and considered one of the greatest classic amps—needs no introduction. Ditto the beloved Dyna-Kits, affordable ready-to-assemble kits for building preamplifiers and power amps that also proved very popular, even ubiquitous, during the 1950s and 60s. (ST-70 fans, rejoice: A newly updated version of the ST-70 will be reviewed in TAS soon.) In 1977, he founded the David Hafler Company, which pioneered the use of MOSFETs; certain models such as the swarthy DH-500 stereo amp became successful in both home audio and studio applications. Such consumer hi-fi and pro-audio overlap would presage the brand’s future—and present. Fast-forward to 2014: Hafler has been reintroduced to the hi-fi market under the auspices of Radial Engineering Ltd., a Vancouver B.C.-based company widely known for its pro-audio presence that acquired the Hafler brand in 2014. Because Radial had served as the former Canadian distributor for Hafler, it already had intimate knowledge of the Hafler brand and its products. Although the company has also released a line of headphone amps this year, its new compact phonostages and step-up transformers are the inaugural products in the Dynaco-Hafler relaunch. In addition to the PH60 moving-coil phonostage under review here, the PH50 moving-magnet phonostage and two phono step-up transformers, the PH34 (31dB gain) and PH44 (20dB gain), comprise the rest of the first offerings. Interestingly, the marketing materials for these components contain testimonial quotes and endorsements from a number of high-profile recording engineers who have worked with world-famous musicians. There’s that pro-audio crossover again! All told, it’s fitting that Radial is striving to continue Hafler’s heritage of high quality, reliability, and affordability. Oh, and unlike a majority of price-friendly gear that’s manufactured overseas these days, all of these components are made in Canada to Radial specs. But let’s get back to the worthy entry-level mc phonostage, the small wonder known as the Hafler PH60. As you read on, you’ll see it has a lot to offer sonically and functionally for its quite reasonable $599 retail price, including a three-year transferable warranty. 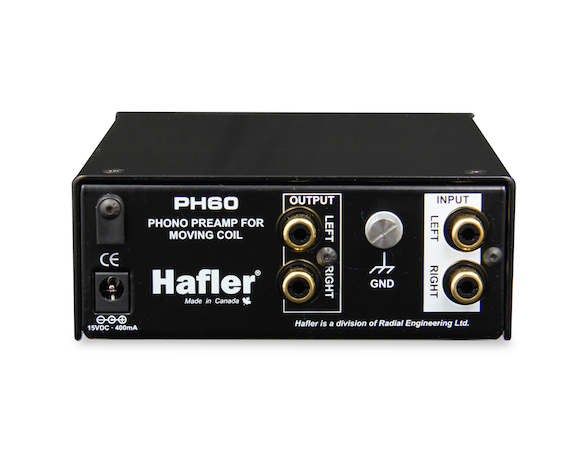 The PH60 is a small-scale, if basic, well-made little box—this is one component that won’t cause concerns about equipment rack space! An active phono preamp, it combines a 100% discrete Class A transformerless head-amp design with a well defined RIAA curve “to preserve and transmit the original program material with minimal coloration.” The solid-state circuitry is through-hole soldered onto a military-grade circuit board for durability. (A bird’s-eye-view photo of the board actually appears on the Hafler website.) Although its surface area is small, careful attention has been paid to parts positioning to minimize noise and crosstalk—it’s certainly trickier business to amplify the lower output signal of a moving-coil cartridge than that of a moving magnet. Additionally, in its drive circuit the PH60 uses metal-film resistors and full-sized capacitors that are inserted by hand. As for mc cartridge loading options, you can choose between 25 ohms, 50 ohms, 100 ohms, and a custom load (a custom-calibrated resistor can be ordered from the manufacturer for a nominal fee, then soldered into place). However, to access the cartridge-loading jumpers you must remove the PH60’s cover. (The user guide includes a diagram and instructions for this.) Given that the vast majority of mc carts have a recommended loading of 100 ohms, the PH60 comes factory set for that. While I appreciate the clean simplicity of the chassis design—with only two push-buttons in front (power on/off and a low-cut filter option) and just enough room in back for the RCA inputs and outputs (which are gold-plated), power in, and ground—I would have preferred the flexibility of being able to experiment more readily with my cartridge loading. But this is a minor personal quibble. As for the outside, the PH60’s form follows its basic, no-nonsense functions. The chassis is the same one used across this series. It’s made of virgin steel “folded” into a U-shape for solidity. And there are no decisions to be made about finish: Black is the color. But I was surprised by the red cord that connects to the 15V outboard power supply that comes with the PH60. By design it’s meant to be “plug-and-play” and indeed it is (with the possible exception of accessing the internal jumpers to adjust load settings). So let’s talk about playback and its sound. As I get spoiled by the many opportunities to listen to ultra-high-end gear, the PH60’s intended place within the market had to be kept in mind. So I tailored my critical listening more or less to the parameters I deemed reasonable for a $599 phonostage—though most of the ancillary gear I had on-hand was not true entry-level (see Associated Equipment). Before I delve into specific musical examples, here are some general observations. Not unexpectedly, a lot depended upon the quality of the source material. The more well recorded an LP was, the more true-to-life/how-I’m-used-to-hearing-it-on-reference-systems it sounded. Less-than-terrific source material varied more widely in playback (and to mixed results at times). Broadly speaking, there’s an emphasis on the power range, which would please a good many listeners. In general, horns, strings, and vocals were outstanding and often the most realistic in tone and texture. More often than not, the PH60 seemed to tilt towards the darker end of the sonic spectrum. However, across assorted LPs I found timbre and detail to be among the most variable of the PH60’s characteristics, especially (as noted) with less-than-stellar discs. The listening examples below would be considered recordings of good-to-excellent quality.